How are you spending your weekend? We’re going camping! After three weeks of fostering the kittens, we’re in serious need of a relaxing break. And right now, I can’t think of anything more relaxing than barbecuing under the stars, nibbling on breakfast burritos al fresco and chomping on these healthy chocolate chip oatmeal cookies during our forest walks. In case it’s not obvious, the only reason I ever go camping is for the food. Loads of smoky grilled meat, ooey-gooey s’mores and plenty of snacks. That is my idea of a relaxing weekend! It took me a long time to get these healthy chocolate chip oatmeal cookies right. First I tried making them with Greek yogurt and no butter – nope. They ended up more cake-like than cookie-like. Then I substituted the dairy butter for coconut butter. They tasted beyond amazing when they were warm – packed full of coconut flavour – but totally fell apart after they’d cooled. Then I went back to the drawing board and looked at my recipe for The Best Ever Seriously Oaty Chocolate Chip Cookies. I tweaked that recipe a tiny bit and came up with these incredible bites of total deliciousness. You might want to think about doubling up on the ingredients for these cookies and making a great big batch. They taste so amazing that you’ll fly through one batch of cookies in just a couple of hours! My boyfriend is always really sceptical of healthy desserts. But even he won’t stop wolfing these down. So if you’re not sure if your friends and family will like these cookies because they’re lightened up, just don’t tell them they’re healthy. They contain no weird ingredients (ahem, like chickpeas). Just fewer of the bad ingredients you usually find in cookies. 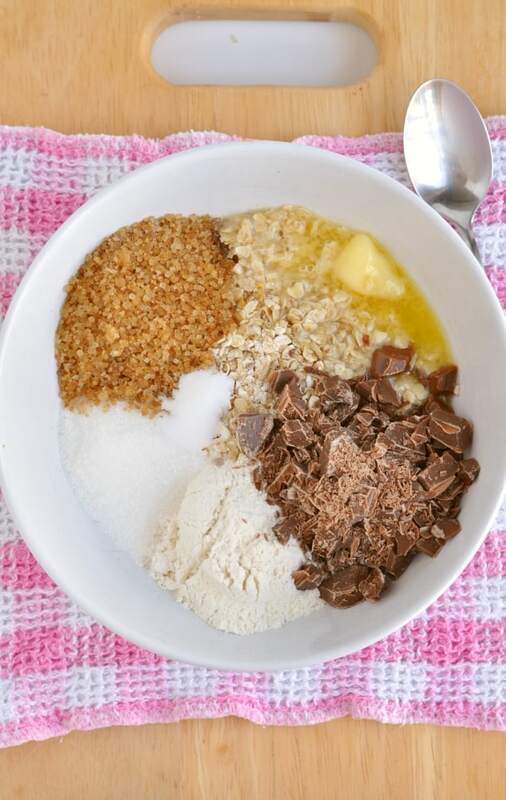 A couple of things before you rush off into your kitchen to whip up the best ever healthy chocolate chip oatmeal cookies. First off, these cookies aren’t giant – they’re pretty small. Each cookie works out around 1 heaped tablespoon of cookie dough. If you want XL cookies, use 2 heaped tablespoons of cookie dough for each cookie. They’ll still only work out 100 calories each. And second – a lot of you have been having trouble with dry dough. I’ve tried my hardest to replicate the results you’re getting, but I just can’t! My only suggestion for fixing the problem of a dry, crumbly dough is to add a little bit of milk just 1 teaspoon at a time. The dough is pretty dry, but when you tip it onto the counter and roll it into balls, it comes together. Trust me! 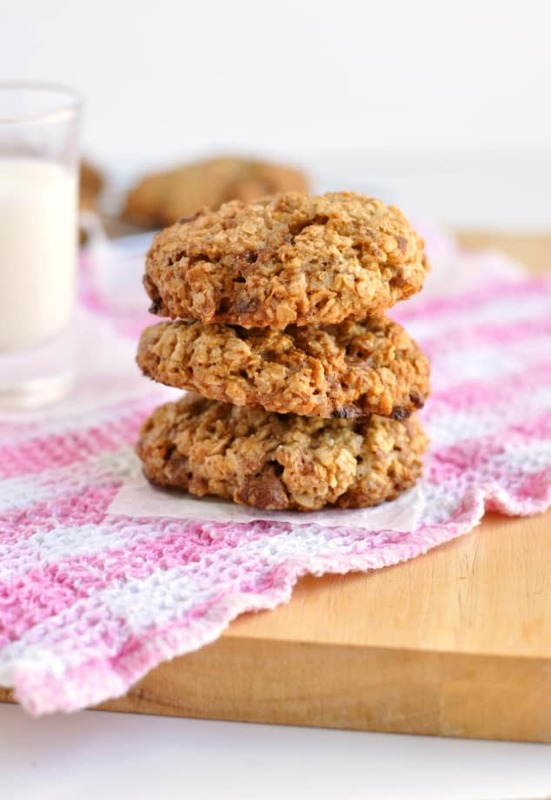 The healthy chocolate chip oatmeal cookies recipe below includes gluten-free and dairy-free suggestions. 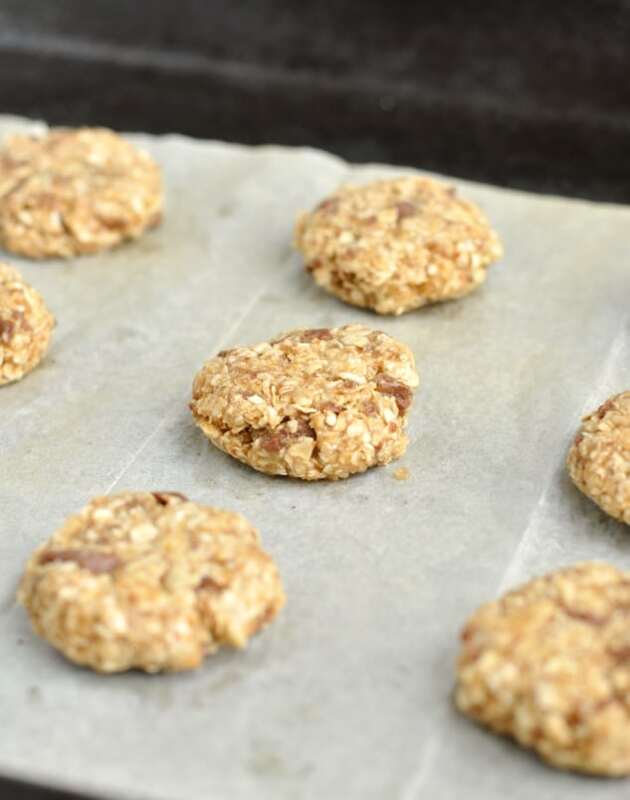 But if you are cutting out gluten and dairy, I recommend you follow my low FODMAP healthy chewy chocolate chunk oatmeal cookies recipe instead. 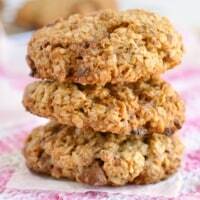 Wonderfully chewy, delightfully crumbly and just the right amount of sweetness, these really are the best ever healthy chocolate chip oatmeal cookies in the world! They work out at just 50 calories each and come with gluten-free and dairy-free options. Yay! Preheat the oven to 350F/180C and stir all the ingredients together in a medium-sized bow. 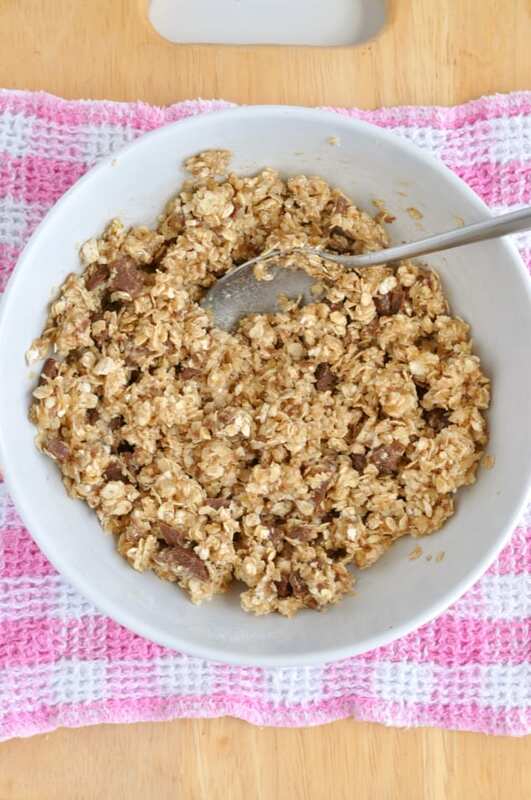 If the cookie dough feels a little dry, add more milk 1 teaspoon at a time until it takes on a strong enough consistency so you can roll the dough into balls. Evenly divide the cookie dough into 12 pieces and roll each one into a ball. Line a baking tray with parchment paper or a silicone baking mat and lay the balls out onto the lined baking tray. Press each ball down slightly with your palm to create a more cookie-like shape. These cookies don't spread very much. Bake the cookies for 14 minutes until they just begin to brown. Leave to cool on the baking tray (they'll carry on cooking a little longer on the tray) until they reach room temperature. Fostering kittens is a big undertaking (I know from experience!) You definitely deserve a break and a big stack of these cookies! I haven’t made cookies with oatmeal in forever. Must fix that ASAP! It’s nice to hear from someone else who knows what a tough job it can be, Megan! THE COOKIES ARE TERRIFIC BUT KITTENS GROW UP TO BE CATS, AND I HATE CATS. 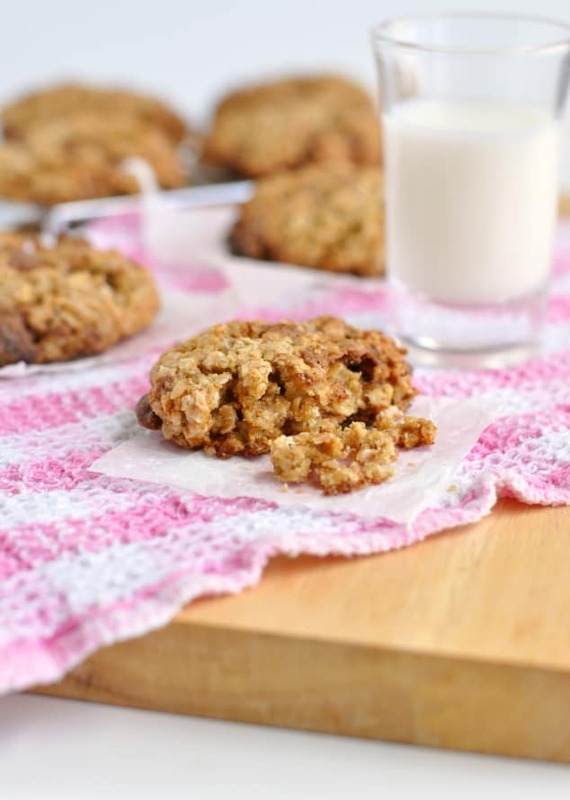 For a slightly doughier cookie i only added one cup of oats and it was great! Do you think raw sugar could be used instead of white? Hi Cindy! I think you probably could use raw sugar, but the cookies will have more of a grainy, crunchy texture. If you’re trying to avoid white sugar, coconut sugar would be a good substitute. I need to mail a non perishable food gift– are these ok at room temperature? Thank you!! Hey Julia! I think these would be perfect for mailing. They’ll be a-okay at room temperature for up to five days. There’s no way this recipe makes 12 cookies. 3/4 c of oats and 2 tbsp of flour does not equate to a batch of normal size cookies. I doubled it and got exactly 12. I’m excited to try them tho! Hi can you put honey instead of sugar. I’m really sorry, but you can’t use honey instead of sugar. You need a dry, granulated sweetener. Otherwise it will change the batter.